The global automotive camera market was valued at $11,401.6 million in 2017, and is projected to reach $24,092.1 million by 2025, registering a CAGR of 9.70% from 2018 to 2025. The automotive camera is an onboard camera, which is designed to capture the highest quality video to extend visibility for enhancing the safety of the driver. These cameras are majorly used to assist the driver for parking, to assess vehicle performance, for night vision, and to gather critical evidence. Furthermore, they are embedded with advanced computer vision algorithms, which extract meaningful data from the captured images to assist the driver for various purposes, and play a crucial role in advanced driver assistance systems (ADAS). Furthermore, the safety and security concerns among consumers have increased tremendously, thereby having a positive impact on the growth of global automotive camera market. However, high installation cost of the cameras restricts the market growth. On the contrary, expected increase in trend of installing advanced driver assistance systems (ADAS) and legislations mandating installation of cameras in vehicles are expected to provide lucrative opportunities for emerging as well as existing players in the global automotive camera market. The key market players profiled in the report are Automation Engineering Inc., Robert Bosch GmbH, Continental AG, Aptiv PLC, Stonkam Co., Ltd., Mobileye N.V., Autoliv Inc., Magna International Inc., OmniVision Technologies, and Valeo. The automotive cameras market is segmented on the basis of application, technology, vehicle type, and region. By application, the market is categorized into park assist system, lane departure warning system, adaptive cruise control system, driver monitoring system, autonomous emergency braking system, blind spot detection, and others. Based on technology, it is classified into infrared camera, thermal camera, and digital camera. Depending on vehicle type, it is segregated into passenger cars, light commercial vehicles, and heavy commercial vehicles. Region Wise, it is Analyzed Across North America, Europe, Asia-Pacific, and LAMEA. 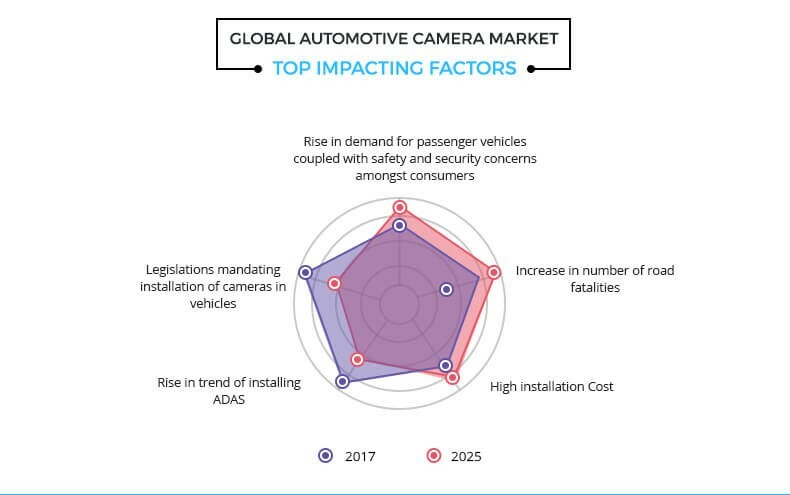 The significant factors that impact the growth of the global automotive camera industry include a rise in demand for passenger vehicles coupled with safety & security concerns among consumers, increase in number of road fatalities, high installation cost, growth in trend of installing advanced driver assistance system (ADAS), and legislations mandating installation of cameras in vehicles. Each of these factors is anticipated to have a definite impact on the automotive camera market during the forecast period. According to the fact sheet of the World Health Organization, road traffic injuries are the leading cause of death among people aged between 15 and 29 years. Around 1.25 billion people die every year as a result of road accidents. In addition, 90% of the world's fatalities on the roads occur in low & middle economical countries, though such countries have approximately 54% of the world's vehicles. Moreover, for most of the countries road accidents cost 3% of their GDP. Such factors result in increased demand for vehicles which are equipped with cameras for safety & security of the vehicle, driver, and passengers. As the cameras incorporated in the vehicle can provide blind spot detection, drowsiness detection is expected to significantly minimize road accidents. Furthermore, road accidents cause considerable economic losses to individuals, their families, and to nations as a whole. Such losses arise from the cost of treatment as well as lost productivity for people killed or disabled by their injuries, and for the rest of family members, which in turn fuel the demand for automotive cameras, thereby supplementing the market growth. The installation cost of automotive cameras is considerably high. In addition, latest technologies such as advanced driver assistance systems (ADAS) require cameras for numerous applications such as lane detection systems, blind spot detection, lane departure systems, and others, which are expensive. Hence, high cost of the cameras is anticipated to significantly hamper the growth of the automotive camera market. Numerous legislations have taken the initiative of mandating the installation of cameras in the vehicles for safety purposes. According to the New Car Assessment Programs (NCAPs) policy, vehicles need to have safety ratings to encourage significant safety improvements in new car designs. Similarly, the national highway traffic safety administration (NHTSA) has announced that all the new light vehicles, including SUVs, trucks, and vans must be incorporated with a backup rearview visibility camera starting from May 1, 2018. Increased focus of the government on road safety is expected to fuel the growth of the market in the near future. 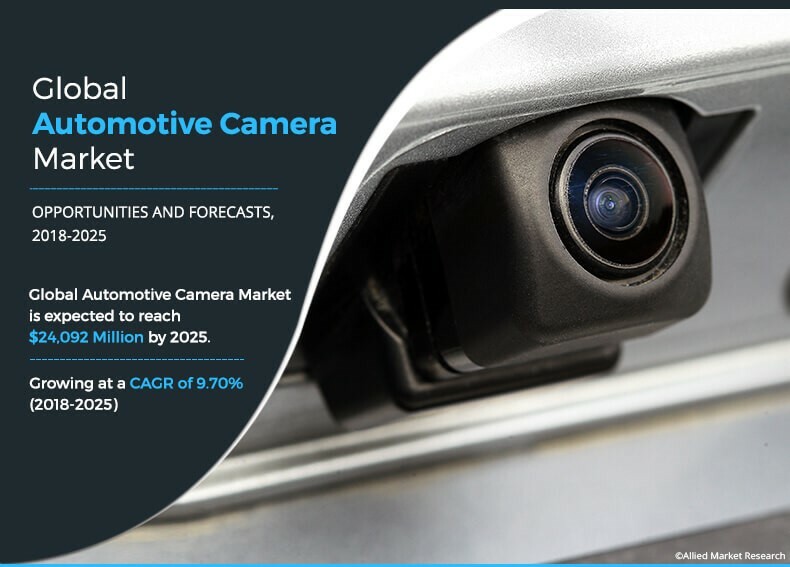 This study comprises an analytical depiction of the global automotive camera market size with current trends and future estimations to depict the imminent investment pockets. The report presents information related to key drivers, restraints, and opportunities with detailed impact analysis. The report includes the market share of key vendors and automotive camera market trends. Automotive cameras are expected to curb down the number of traffic accidents significantly. Thus, the future cars might be mirrorless, and completely be based on cameras and AI technology for navigation. For instance, Mitsubishi, announced in January 2018, that it developed the automotive industry’s highest performing automotive camera technology. The cameras incorporated in the vehicle can detect objects up to 100 meters away. In addition, the technology boosted the object detection accuracy from 14% to 81%. The automotive camera market holds high potential for the automotive industry. The current business scenario is witnessing an increase in the demand for automotive camera, particularly in the developing regions such as China, India, and others. 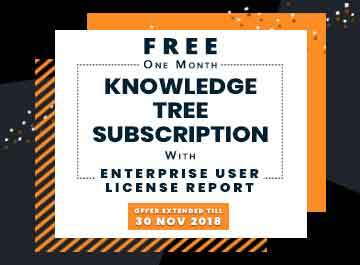 Companies in this industry are adopting various innovative techniques to provide customers with advanced and innovative product offerings. Among the geographical regions, North America exhibits the highest adoption of automotive cameras. On the other hand, Asia-Pacific is expected to grow at a faster pace, predicting lucrative growth. 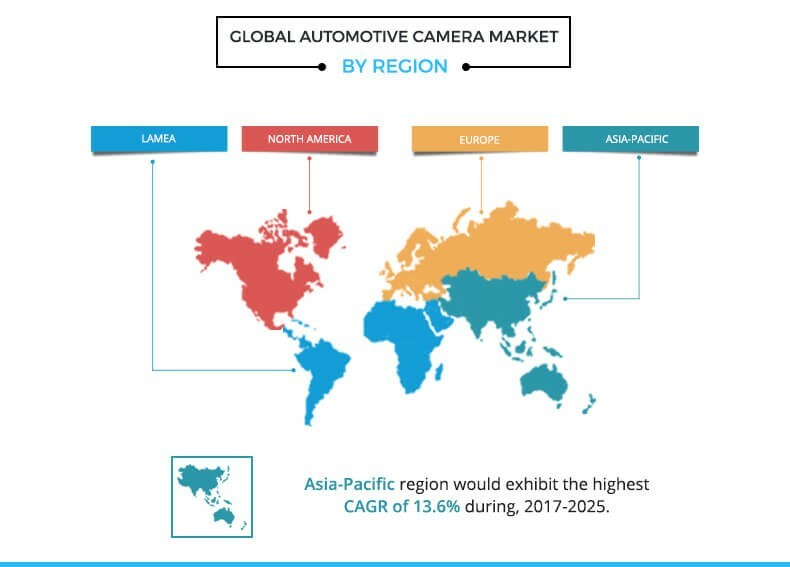 Automation Engineering Inc., Robert Bosch GmbH, Continental AG, Aptiv PLC, Stonkam Co., Ltd., Mobileye N.V., Autoliv Inc., Magna International Inc., OmniVision Technologies, and Valeo are the key players that occupy a significant revenue share in the global automotive camera market.